Welcome to the RV Photo Gallery. 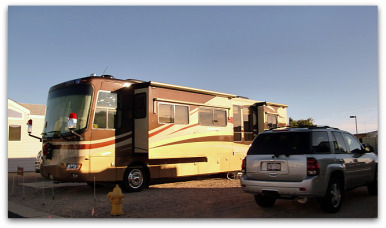 You'll find RV photos here from many of our visitors and RV friends. Show off your RV and travel photos! 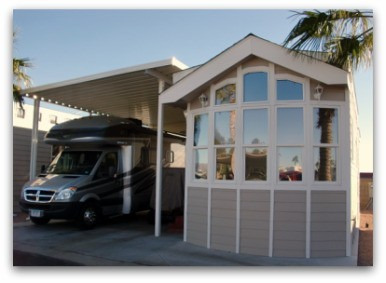 Do you have a great RV photo you'd like to share on our website? Then don't be stingy - share your RV pictures. Upload your photo on the easy form below and tell us your story behind the photo. Sharing photos of your RV, your RV Trips and Travel Adventures. Browse through the photos to see what other visitors have shared. We love to see fun pictures of others enjoying their RV activities and the RV Life, so why not add yours to our collection of exciting pictures in the photo gallery for other visitors to see. You can also share recipes and photos on our RV cookbook page, or Fulltime Rving page. Read what others have submitted and then share yours for others to enjoy. Do you have a great RV photo? Share it! I am plumb lucky to drive this coach and live in her. It was my first night on the BLM land in the desert near Lake Havasu City, Arizona and this was my view of the sunset from my RV. Life on the road... '03 Dodge & '01 Alfa Gold. 2010 Everlite 29 FK. Front kitchen and rear bedroom. 2011 Ford F-150 Ecoboost. Crossing Texas on a trip around the N American Loop spotted this sign in a pleasant Park in Gonzales. 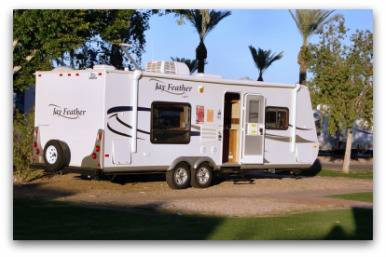 The Jayco Feather Sport trailer is the lightest Jayco trailer they make. Super easy to tow and although compact it sleeps up to five people.